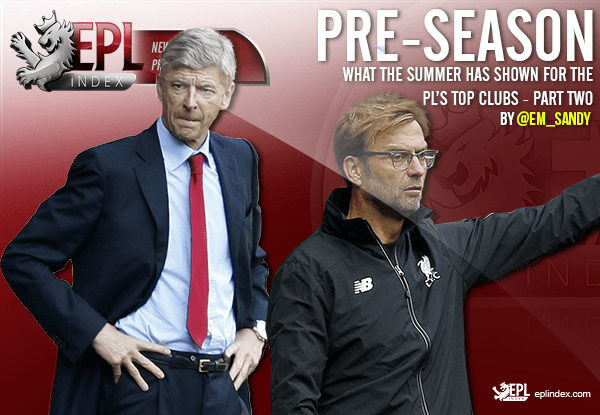 The Premier League season starts again in just a few weeks and already the pre-season campaign has shown lots of things. Manchester United, Chelsea, Manchester City and Everton have all welcomed new managers to the frame, whilst Claudio Raneri, Jurgen Klopp and Mauricio Pochettino look to build upon their developments from last year. It’s already clear Antonio Conte’s got his hands full at Chelsea after the Blues’ stuttering start to their pre-season campaign but Jose Mourinho looks set to field an impressive squad as his Manchester United reign kicks-off. Zlatan Ibrahimovic has demonstrated his goal-scoring abilities whilst N’Golo Kante has shown ambition by making the switch from the current champions to last season’s struggling side, Chelsea, but what else has been suggested from this summer’s activities? Read part one here! Every summer, Gunners’ fans are victims to mocking and rightfully so. Arsene Wenger hasn’t made many big-money signings in his time and the last one which really excited fans was Alexis Sanchez’ switch from Barcelona in July 2014. It’s been another summer of ‘same old’ from the Frenchman and it’s unlikely Arsenal will make many more signings before the window draws to a close. The only major signing for the Gunners so far has been former Borussia Munchengladbach star, Granit Xhaka, who cost a whopping £34m in a rare big-money transfer. Gunners fans weren’t overly impressed by his performances in the European Championships though and it was a large price-tag so the new Arsenal man will have a lot to do to win over support in London. Although they’ve been linked with European star, Alexandre Lacazette, Arsenal are yet to seal the deal and he could become another player to fall through their hands after Jamie Vardy publicly announced he ‘wasn’t interested’ in joining them. Leicester City’s other star player, Riyad Mahrez, has also been linked with the move but it’s hard to see why he’d choose to join a side which has clearly stagnated in recent years. Arsene Wenger’s job was under question at the end of last season and another quiet summer transfer window won’t have helped his cause ahead of the new campaign. Although the Gunners always seem to qualify for Europe, there’s only a certain amount of time they can go on without winning major trophies. Jurgen Klopp’s been busy this summer, chopping and changing his squad in order to reduce numbers and improve quality in the starting eleven. The German boss has been ruthless; he’s let go of a number of senior players including Martin Skrtel, Joe Allen and Jordon Ibe and there could be a few more on their way before the summer ends. Liverpool fielded 39 different players throughout last year’s campaign but after releasing a number of players, they’ve also added some more quality to their starting eleven and Klopp’s continued to give youngsters an opportunity to shine during pre-season. Sadio Mane, Georginio Wijnaldum, Marko Grujic, Loris Karius and Ragnar Klavan are some of Liverpool’s new recruits and all will expect to start most of the Premier League campaign. However, there’s also a return to fitness for Danny Ings, who missed almost the entire 2015-16 season due to an ACL injury picked up on Klopp’s arrival and on-loan winger, Lazar Markovic. The England international will be like a new signing for the manager and he’ll hope to merge Ings and Mane into the Liverpool attack alongside Philippe Coutinho, Roberto Firmino, Daniel Sturridge, Divock Origi and Adam Lallana. Klopp’s also given opportunities to a number of youngsters throughout the pre-season campaign and Cameron Brannagan, Ovie Ejaria, Ben Woodburn plus Andre Wisdom have been given further options across the pitch after impressing. All-in-all, there’s depth in midfield and attack for Klopp and although his defence still looks a little short, it’s an encouraging transition period for Reds fans. The Foxes were the only team talked about towards the end of last season and after lifting the Premier League trophy, it was Leicester City which was the topic of all football fans. However, throughout the summer, most of the talk has been elsewhere and Raneiri has had a quiet pre-season compared to some of his colleagues. The arrival of Conte, Guardiola and Mourinho has stolen the limelight this summer and the focus has largely been on how the new managers have impacted their sides so far. Unsurprisingly, Mourinho’s caused the most stir, bringing in big names, Zlatan Ibrahimovic, Henrikh Mkhitaryan and the imminent arrival of Paul Pogba. Guardiola’s training methods have already looked dynamic and he’s used his reputation to bring in Ilkay Gundogan from Borussia Dortmund. Conte’s challenge is clear but he’s made some steps to improve Chelsea’s performances and will be sure to demonstrate development throughout the season. Meanwhile, Raneiri’s hardest task has been keeping hold of his star players and he’s already lost N’Golo Kante to Chelsea. Jamie Vardy looks set to stay after shrugging off offers from Arsenal but Riyad Mahrez has expressed his interest in a move away. The champions don’t look set on changing much after such an impressive season but as other clubs around them continue to improve, Raneiri may be forced to try his hand at something new before the summer is out. I think Cech was a pretty big signing for Arsenal? Golden Glove last season! I think Xhaka got a few man of the match performances for his country in the euro’s too so unsure on who would be disappointed with him? I guess we’ll have to watch this space but i think it more likely a CB and Striker will be signed than not for Arsenal. As an Arsenal fan i can tell you now that i feel perfectly comfortable right now. All the right noises are being made and Wenger himself has confirmed he wants a CB and Striker. In comparison to Klopp, making a tonne of signings doesn’t translate in to a successful season, this is a mistake they have made before. Interesting read but like a lot of media it is a little untilted for the gunners. It’s a club people love to hate but in my opinion Wengers devotion to run a club as a successful business and to give his players and youngsters lots of opportunity is something to be admired. Not Criticised. Categories: Arsenal, Arsenal (NN), EPL Index Featured Article, EPL Team Analysis, Leicester City, Leicester City (N), Liverpool, and Liverpool (NN).' 'Tags: "Manchester United", AFC, Allen, Arsenal, Arsenal (NN), Arsenal Stats, CFC, Chelsea, Chelsea (NN), Chelsea Stats, english Premier league, English Premier League Stats, EPL, epl opta stats, EPL Stats, Klopp, Liverpool, Liverpool (NN), MUFC, opta, Opta Stats, Sanchez, Skrtel, and Wenger.